I have been busy knitting a cardigan but wanted a break and made this little chap. 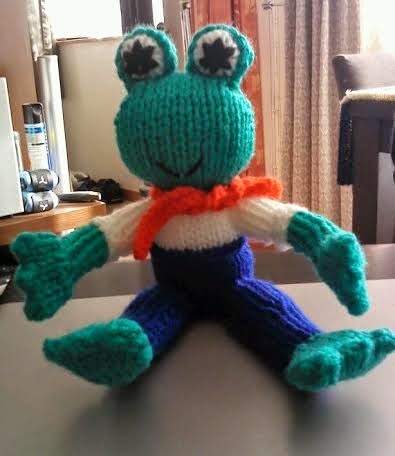 I am on Loving Hands forum and we knit things for various charities and this little character will be part of a family of frogs that will go to Siblings Together. On Loving Hands they have seasonal challenges and this Summer we have various things going on one of which is the Critter Challenge and this time it is Frogs. Anything frog related so wash cloths, dish cloths, hats toys you name it if has a frog on it you can make it. All items go to various charities that can use them to either raise funds or give to people. 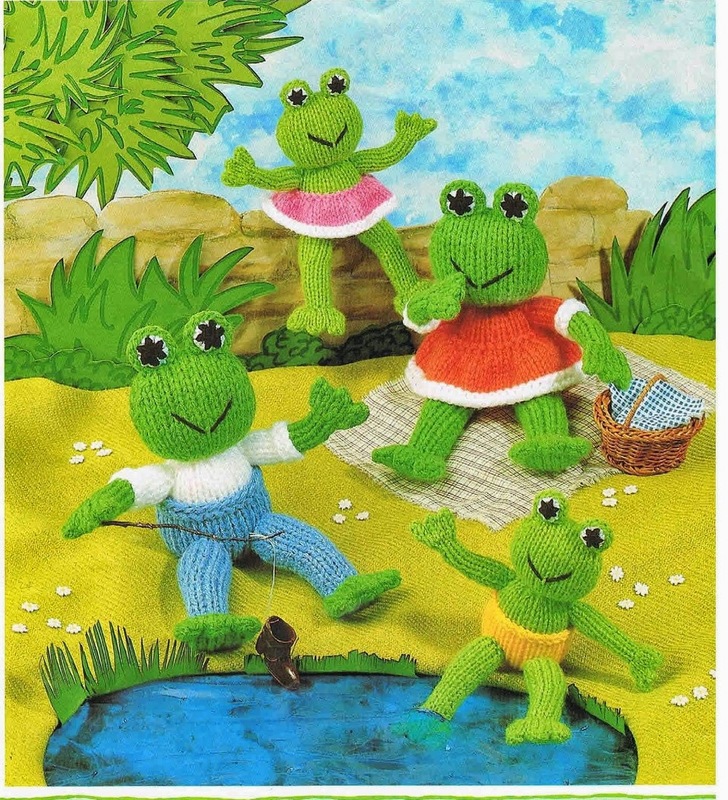 This is the Frog Family in the booklet I added a scarf that is sewn on at the back so it will not get lost. You use two strands of DK yarn held together and knitted on 4mm needles for the Mother and Father Frogs and single DK yarn on 3mm needles for the frog children. That way you use the same pattern and amount of stitches to create two different sized frogs. Why I chose Siblings Together. Many years ago when I was 11 years old my Mother had Cancer and it was not looking good. If things had not gone well then myself and my brother would have ended up in care and back then the chances of us being together was slim. I knew this and worked hard to make sure everything was as easy as possible for my Father so I took over the running of the home and made sure my brother who was 5 years old at the time was clean as I insisted he bathed every night and had his hair washed as well. I was determined that we would stay at home no matter what as the thought of being separated from my brother was unbearable. Thankfully my Mother survived and we did not go into care but it was a close run thing. So I know how I felt at the thought of being separated from my brother and realise how how hard it would have been if we had been taken into care. The children love poncho's, hats, blankets, bags for carrying their small items at camp and whatever you could possibly think of, toys, definitely teddies, dolls all sorts, all the more special because they have been made especially for them !!. So I will make the frogs and send them off I am sure some of the children will like them as they are different. This grabbed my attention. This morning I posted off a small box to Siblings Together. It contained knitted teddy bear glove puppets and 3 small stuffed toy dogs that my daughter never played with. They even still have their new tags on. They will love your friendly frogs.